Part 2 – Electrical design. Part 5 – Painting of buildings and natural elements. Part 6 – Embedded computing and setup of DCC controllers. Firstly I am designing a track that is movable from a storage hook on a garage, to a pool table in my living. This requires a baseboard, which I constructed with three cross breams, an MDF sheet and Tasmanian oak edging. I used the Simple Computer Aided Railway Modeller (SCARM) to plan my layout. A read over an old German railway construction guide gave me a lot of practical hints as to what made a good layout. 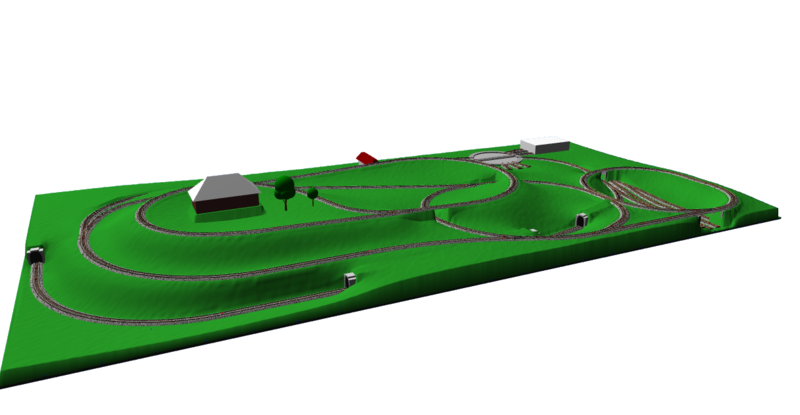 Layout as viewed from the front. layout as viewed from the rear. Setting up the levels for hills and track. The frame work is wood and MDF. Before getting into some neat tricks, lets look at a time lapse. The track plan is printed 1:1 on a standard printer using 40 pieces of paper, there is a trick to doing this in SCARM. 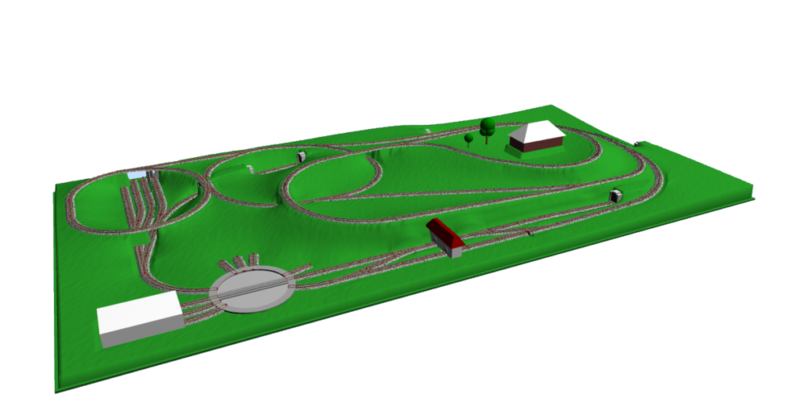 The layout is placed on the board and a toy train is run over it, just to get a feel for what it will be like to interact with. Spacers are cut on a table saw, so that the MDF can be set to the correct height for the track. Contours are cut from MDF using a jigsaw and the track carver up and placed on top of the MDF. Everything is assembled, a brad gun and wood glue is a quick way to get this done. I screw down the MDF, without glue, so I can run wires later. I built a cabinet to hold the trains and keep them dust free. It is build like a picture frame, but I used the table saw to create a ‘grove cut’ on the frame. The grove allows two pieces of acrylic to slide like doors in the frame. If your not 100% on table saws, this video is terrific. (10:20 explains grove cuts). The wood is Tasmanian oak (to match the table) and the finish is Linseed oil followed by a glossy furniture polish. Frame Cutting in Tasmanian oak is fraught with random peril. If you cut the long edges first, you can reuse failed cuts for the short edges, saving timber.